Move more and be brave! Artist, author and movement coach. Learn more about Julie here and on her website JulieAngel.com Positive Aging – Julie Angel from Anya Chibis on Vimeo. An artist, author, movement coach, founder of See&Do & eternal optimist dedicated to sharing knowledge and stories that inspire others into action. Starting life from the simplicity and beauty of the South West of England, I’ve always travelled and had a passion for understanding people, places and their projects. 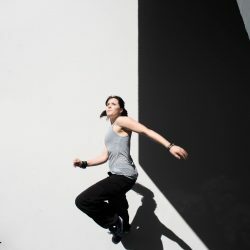 Through my Ph.D. research, award winning short films amassing over 16 million views online, published book ‘Breaking the Jump’, consultations for the United Nations, international academic and artistic presentations, workshops and personal coaching, I help people like you overcome obstacles and rediscover your potential by finding a love of, and meaning in movement. For as long as I can remember I’ve loved moving images and the emotions and inspiration that peoples stories could ignite in me. Learning how someone had achieved or learnt a new skill, overcome adversity and been generous in spirit as a result always inspired me to be more, to learn, grow and share. I’ve always loved anthropology for its celebration of difference and greek philosophy as a way of viewing the world. Creativity and communicating meaning have underpinned all of my work. I’m a multi-passionate renaissance woman and entrepreneur who is as happy leading an outdoor natural movement class as making films, shooting photos and writing books. They are all explorations and a source of inspiration. My interests span the worlds of artists, authors, health consultants, movement coaches, philosophers and entrepreneurs. I worked for twenty years as an independent filmmaker, artistically creating work I like, for, or about, people and companies that I like. 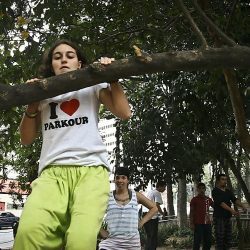 I also spend a lot of time documenting the current ‘age of athletisiscm ‘ – Parkour, Natural Movement, buildering and much more. It’s always been a case of See&Do. By filming and understanding what people do I can share their vision, stories and knowledge to inspire and help you. I’m an artist, anthropologist and teacher at heart. 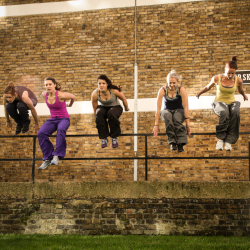 13 years ago I unknowingly started my own journey of reclaiming and re-discovering the meaning of movement when I started to learn Parkour as part of my practise based Ph.D combining documentary filmmaking and the inner meanings and excellence of parkour. I was 35 at the time and had been sat down for years. I was scared of everything. I’ve taken baby steps all the way and am now stronger and more able than I ever dreamed possible. I’m a life long learner and continue to embrace a growth mindset by challenging my habits and fears, moving outside, staying creative and being brave. There is joy in simplicity. 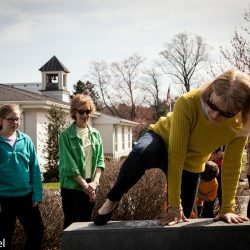 I continued my natural movement education by learning systems such as MovNat and Animal Flow that provided a more holistic approach to the inter-connection of movement, mindset, health and well being. I’m proof that you can always learn and progress and you are never too old or it’s too late. I am currently an ambassador for Merrell. We are all able and can benefit from connecting our mind and body and moving more. Strength, health, happiness and adventure is waiting outside our front door if we know where to look and are supported and informed along the way. I believe that we can age positively by investing time in how we move, what communities we connect with, challenging our self-limiting beliefs, spending time in nature, becoming more minimalist and taking control of our health. Identity is not fixed and you have the power to change your life regardless of your goals and the obstacles in your path. P.S. 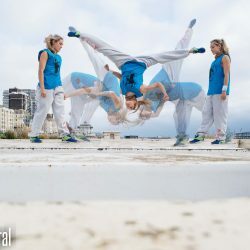 I have the following movement coaching certifications: Parkour EDU Level 1 Parkour Coach A.D.A.P.T. Parkour Level 1 asst. 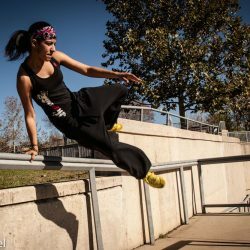 Coach Animal Flow Lvl 1 Instructor MovNat level II MovNat Aquatics MovNat Combatives If you want to learn more about my journey back to movement and the story behind Parkour, my book Breaking The Jump, tells that story. For more information on the book and characters in it, check out the Breaking the Jump website.